Last week, I think it was Wednesday when it had been raining hard during the whole night, we- DH, dogs and I - went for a walk in the nearby forests. We were on a schedule, I had to be in town by one, so we were in a hurry. We did our usual path the opposite way we usually do it, so we decided to do the climb in the beginning and then sort of walk quickly down. I was almost at the top, I was out of breath and slowed down and looked at the ground. And to my horror, there were fresh bear tracks on the ground, the beast was following the same path as us but he was ahead of us, although I suspect he was a she, since my friend saw a cub few weeks ago. I started to talk loudly to warn him and I never stopped talking until we were back at the car... You know this nervous blabbering. I usually enjoy the birds and the sound of the wind in the trees, but this time I wanted none of that, just to be out of the bear's way as soon as I could. I had camera with me, but I never thought for one second to take any pictures. I showed the tracks to DH and he glanced at me and just remarked that they for sure were funny looking trekking shoe prints. Neither of us said out loud anything else about him until we were at home. We did not say anything and I am sure the old behavior took hold of us then and there. Bear is the king of the forest, he was(is) mythical, sacred creature and out of this belief and respect, people in the old times avoided calling his name and we did the same. I have not been on that path since. I am sure I will be walking there many times in future, but not just yet. Boredom is not all bad as when one gets bored, one starts to look around and search for alternatives and something interesting. 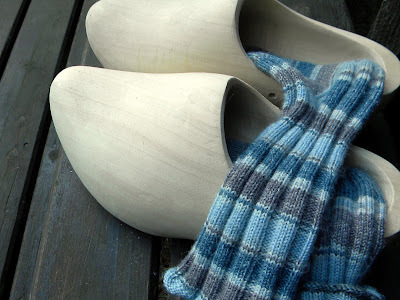 Wool socks are a must up here - I have written this so many times, that I am like a broken record. Anyway, long time ago I wrote "wear thy knitting", meaning that one should knit for use, not for the closets. 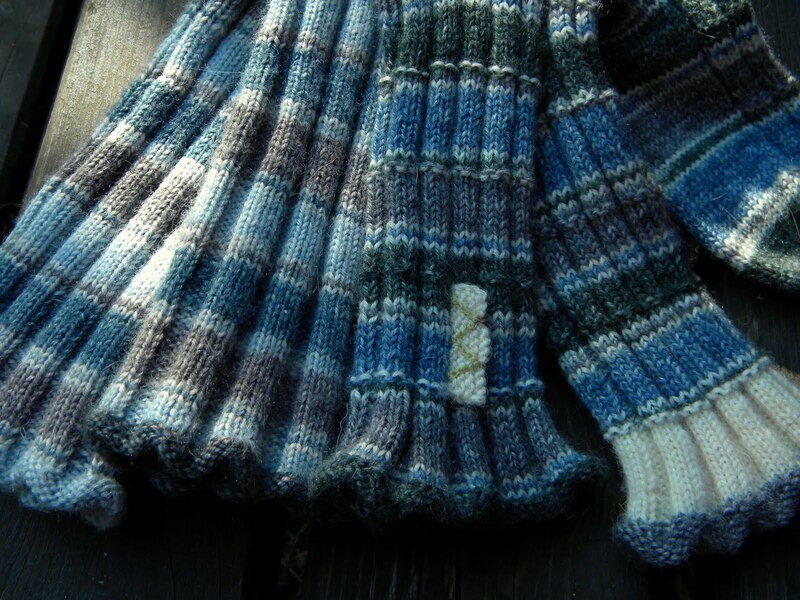 I very often knit items to warm the shelves but socks are not among them. They get worn and so I am in constant need of them. One sock usually gets done quickly but the second sock always takes some persuasion to get done. I think I have come up with a solution and thus under "wear thy knitting" -theme is a subtheme now. I like ribbed socks because they keep their shape and size well but ribbed socks are probably most tedious to knit, they are boring and also slow compared to stockinette. I started - as so many times before - with k4p4 pattern, as this is so easy to hide decreases in. I usually shape my socks a bit. The first sock with all the excitement of a new yarn got done quite quickly, but ah! the second sock!! I know this might not sound as a big light bulb moment, but it was to me, and this, I think, will save my sock knitting: Always knit two socks but never two alike!! I say never alike, and with this I mean just minor changes, but big enough to have little pull towards the second sock. Two pairs done, both definitely a pair, but not exactly the same. For the second pair I added purl rows to the basic k4p4 pattern and added some white to the second cuff plus a little patch to call it my own. 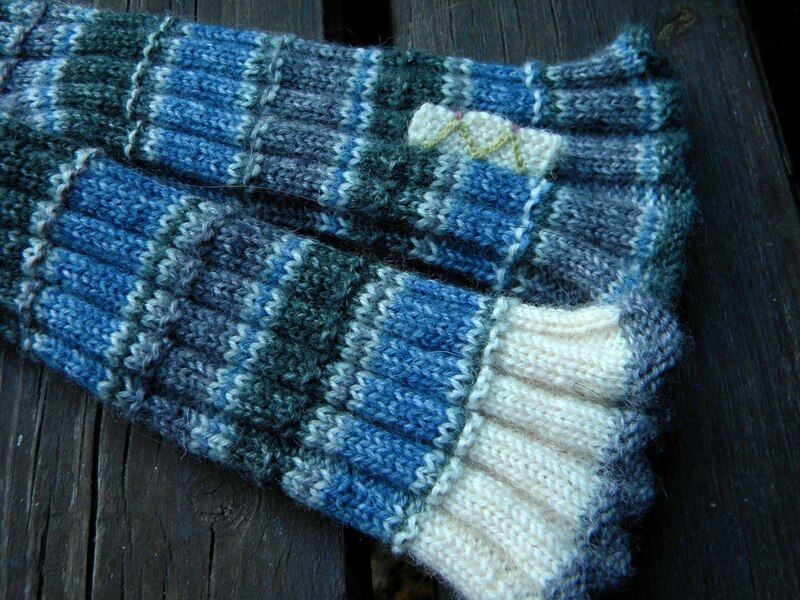 (Both pairs out of basic but good sock yarn, 2mm needles. (It is difficult to take good pictures of socks without a sock model. )I hope this new theme will carry me for a while. I do need few new pairs. PS. The lake temperature at its warmest this summer was 25C/77F, very good for swimming. 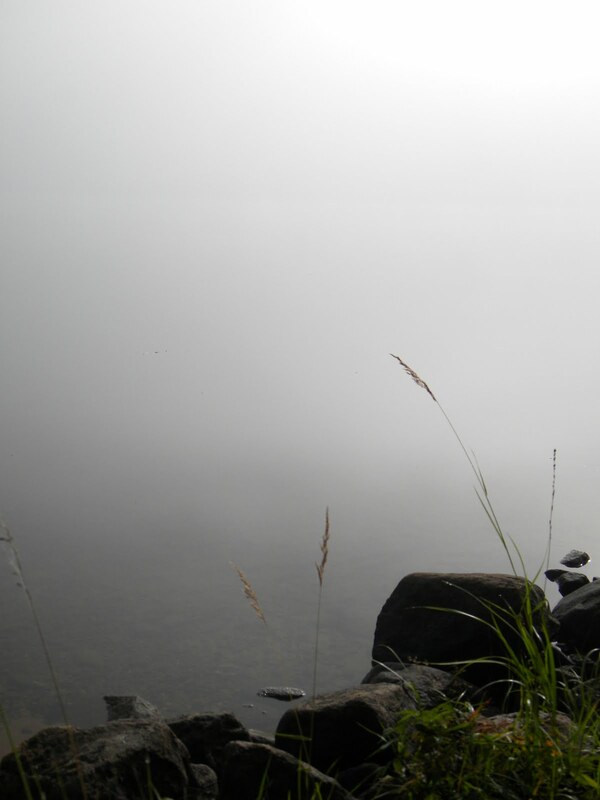 Lately the lake has been wrapped by the mist in the early mornings. I have had four bears at my front door one Spring day(mama and three youngsters), and a large bear inside my screen porch in the middle of the night. These are black bears and a concern because of my goats and chickens and cats and dog. I like my socks to match, but your idea is so wonderful. It reminds me of fraternal twins...not identical twins. Love them-both pairs. As for the bear-oh my! I'd be moving my feet fast! Glad you were safe! thank you for the great idea of changing the second sock. I will do that the next time too. 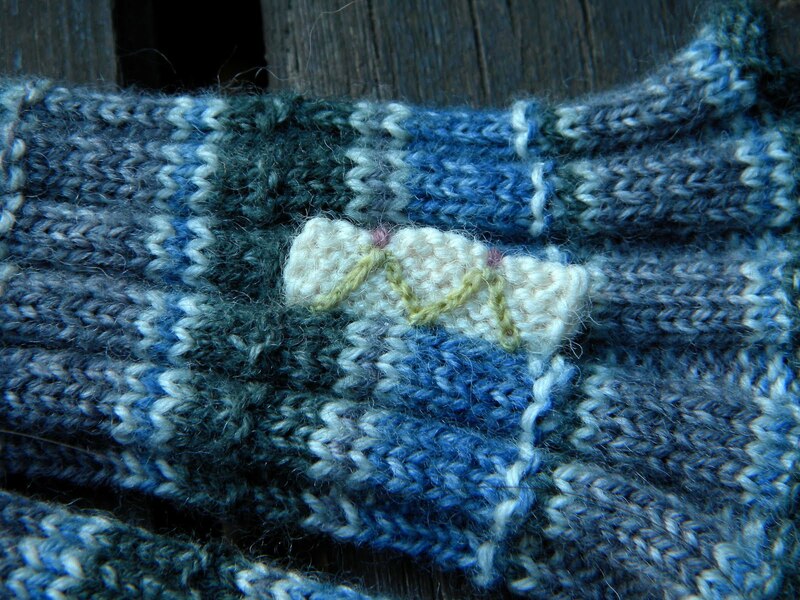 I love the little decorative patch that makes that sock so much your own. It has given me an idea for a pair of Christmas socks in the planning stages. And true, there is nothing like fresh bear tracks to make one feel very small and exposed! Uskomatonta, miten jännittävä kohtaaminen sinulla oli. Hienoa, ettei siinä kuinkaan käynyt. Ihailen suunnattomasti sinun tasaista käsialaasi näissä töissäsi. What a great idea for the socks! I always keep a pair of plain socks on the needles and work them when I'm too distracted for something complicated, such as chatting with friends, or during an action movie, or when I'm too tired to work something more difficult. I do like your subtle modifications. The colors are so similar between them, you could any two of the four together and it would still be enough of a match. Warm feet don't care about pattern. I love the white cuff and patch on the second pair! Like everyone else, I like your sock modification. It could take the tedium out of that 2nd sock. Lovely photo of the lake. I am glad you saw only bear tracks and your walk was otherwise uneventful. I love the idea of changing the second sock just a bit. One could even make a game of it by challenging friends to discover the differences! Sighting a bear track must have been frightening! So glad you are smart and safe. I love the sock idea! Brilliant. And thank you for the beautiful photo of the lake. is what I am doing in that vein... keep going. I am knitting more socks than ever before since I declared no more pairs! Bear tracks are impressive! When we lived in Alaska we always had "bear bells" on our hiking shoes so they could hear us coming. We saw lots of tracks and slashed trees but never the bear.. Your socks are great,so much more fun. I usually start both socks and work on one for awhile and then the other. 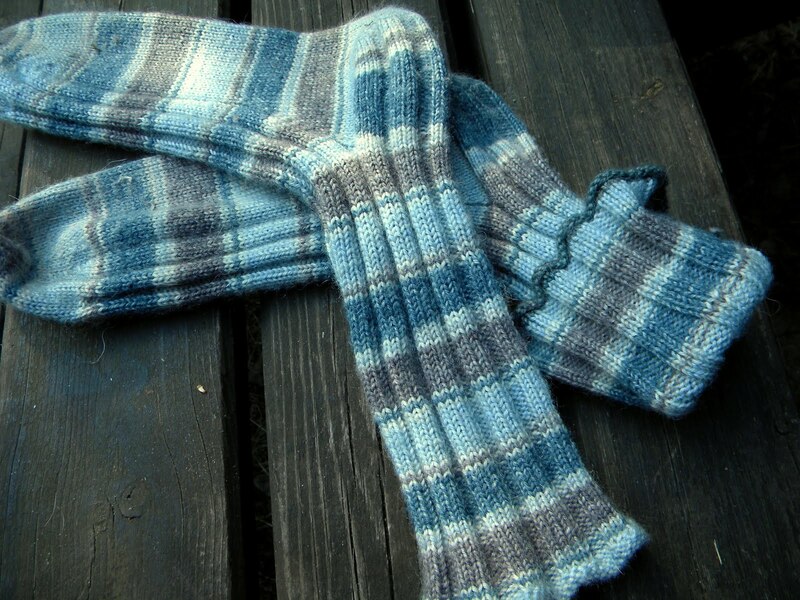 I love to make turkish wool socks that are the same colors but not the exact same design. I am glad that you had the presence of mind to talk and make your way to safety. We have had bears in my neighbourhood, and I live at the edge of the city. I think that we are encroaching on the bear spaces and they have to find food. About the socks, your ideas are brilliant. 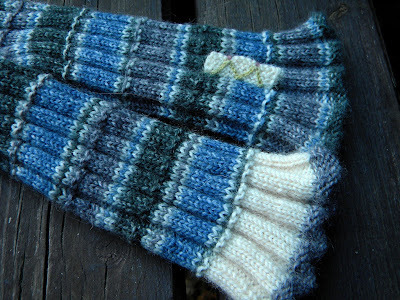 I have been knitting similar socks changing a heel, or starting from different ends of the ball. Anything to keep finishing that second sock. My daughter is now a knitter with a blog (rozaanthony.wordpress.com) and she knits two socks at the same time, on a circular needle, side by each. There was a woman (in a novel?) who knit two socks, one inside the other, alternating the stitches and the yarn, until they were done and cast off, and she pulled one sock out of the other. I think YOU could do that. But if only ONE stitch was wrong ... !! I like 3/3 rib, as the socks stay up a bit better, and I love how the increases in the back (I knit toe-up) make new ribs appear. I saw sign of bear one time, but it was moldy, so not new. I kicked it over - all berry seeds! What pattern are the socks? 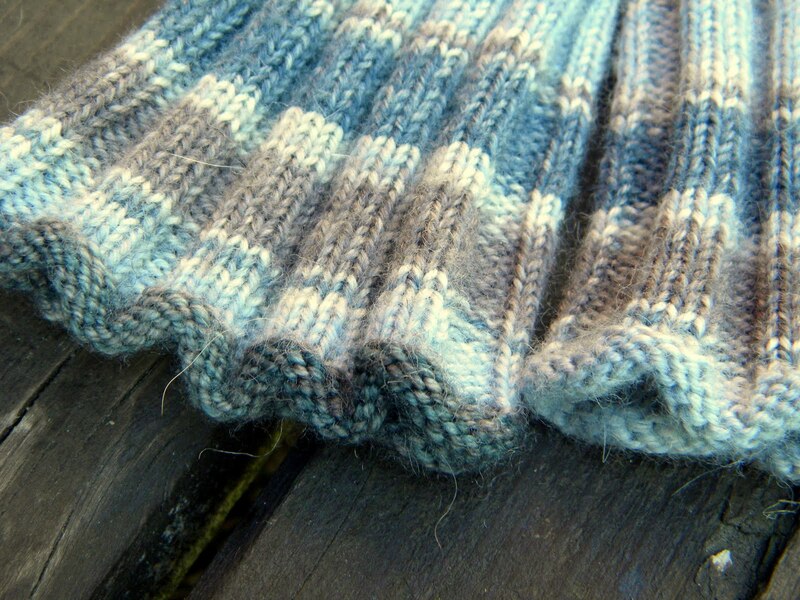 How do you make the lovely cuff? 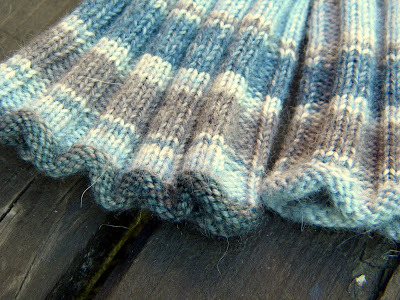 Perhaps different types of ribbing? Chevrons, diagonals, variations on the theme? But your solution is delightful, and borrowable.